It's a proven fact that if you want to be a video game mascot you have to be featured in more than one genre. 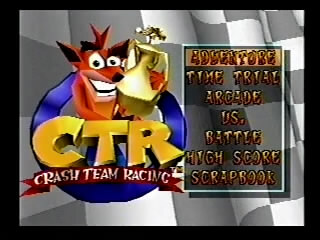 Crash Bandicoot was intended for the mascot role at one point, so the 1999 release of Crash Team Racing was practically inevitable. In typical franchise kart racer fashion, Crash and other characters take to an assortment of tracks and powerslide their way to the gold. Best Adventure time: Single-segment 1:01:06 by Austinn 'Davis' Hallman on 2010-09-30. Best European version Adventure time: Single-segment 0:51:35 by 'Karlie' on 2015-03-24. Adventure Single-segment 1:01:06 by Austinn Hallman. I used Dingodile, because he and Tiny are the fastest characters. And I also made sure to skip as much of Uka Uka's talking as possible. Crash Cove- Decent race, could have better. Lost speed at the beginning of the 3rd lap. Roo's Tubes- Could have had some tighter turns. Did well going under the mushroom. Mystery Caves- First real mess up of the run; losing control at the very end. Sewer Speedway- I used the big shortcut and the slanted wall glitch, but got stopped by the wall on the 3rd lap. Ripper Roo- In the 1st lap, I missed the turbo. Everything else was fine. Tiger Temple- Had good luck getting the right items to open the shortcut. Had some trouble boosting in the narrow hallway at the end of the 3rd lap. Coco Park- Everything was fine. Papu's Pyramid- Messed up the shortcut on the 2nd lap but went for it on the 'replacement' turbo. Papu Papu- Had a little trouble getting around Papu in the beginning. All 3 shortcuts were good. Blizzard Bluff- Got hit by the boulder in the 2nd lap. The 3 lake jumps were good. Dragon Mines- Got hit by the mine cart in the 2nd lap. Polar Pass- The start to the 2nd lap was sloppy. Komodo Joe- Took a dumb fall on the 1st lap. N. Gin Labs- Lost control and fell during the 2nd lap. Cortex Castle- Ran into a few walls during the 2nd lap. Great otherwise. Hot Air Skyway- I got very lucky in the 1st lap when I missed the shortcut but Uka still picked me up and put me on the other side of the track. Oxide Station- Greatness. Used the big shortcut. N. Oxide- Got hit with a nitro on the 1st lap. The 2nd lap was amazing. Great race overall. European version Adventure Single-segment 0:51:35 by 'Karlie'. A : Yeah, that's true, Tiny and Dingodile are the fastest character. Q : Why is there no text on the game ? And before you ask, no, this is not what reduce loading times. It is just because I enabled the PS2 Fast disk speed. Q : Is this WR ? Q : How much can you improve this run ? Are you willing to do it ? Q : How does your boosting last for so long ? Are you cheating ? A : This is a basic mechanic for the speedrun. When you are boosting, you are filling an invisible boost stock which keep your boost on as long as it doesn't reach 0. It decrease by around 1000 each second. A boost can give beetween 0 and 2000 depending how much you fill the boost bar. Q : How do you get this huge boost on N.Gin Labs / Cortex Castle and how do you keep it for so long ? This speed is glitched and has been coded like that intentionally. So when you have this speed, you are not allowed to do any form of boosting. Only simple jumps and drift are allowed. Otherwise, you lose the Ultimate Sacred Fire. Q : What's with the hop on some tracks ? A : When getting a speed above the usual maximum (When you pass on a normal boost pad) by getting a downhill, speed ghosts, USF, etc... .
Q : No comment track by track ? A : I haven't got anything particular to say. Everything in general has been said above.